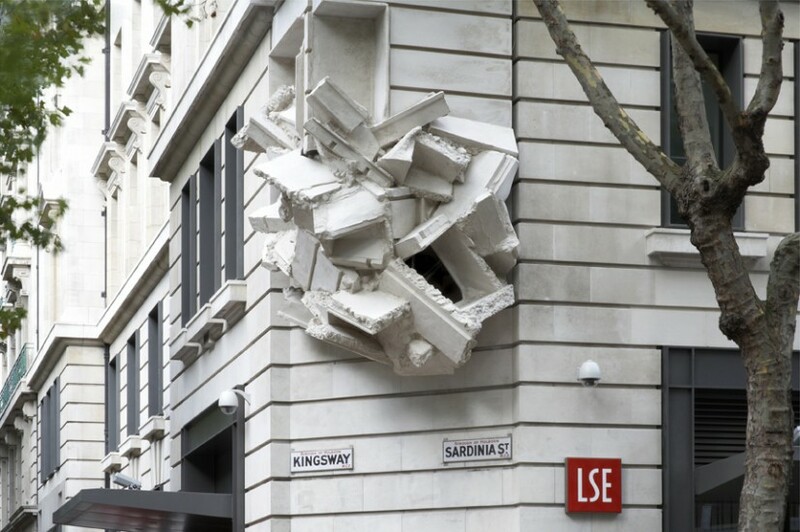 A major architectural intervention, Richard Wilson‘s Square the Block has been installed on the northwest exterior of the LSE’s New Academic Building at the corner of Kingsway and Sardinia Street. 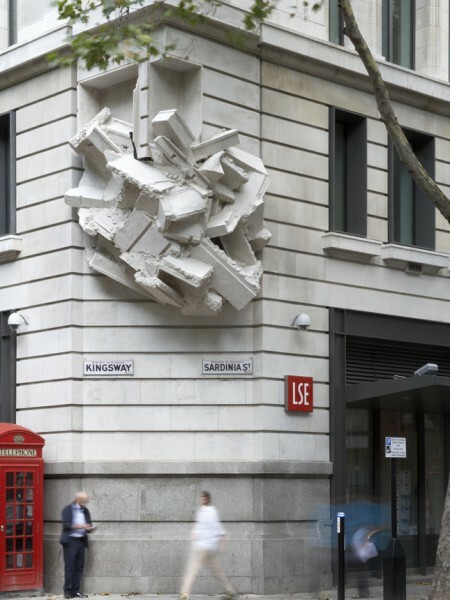 Commissioned by LSE and curated by the Contemporary Art Society, Square the Block is a spectacular outdoor sculpture that both mimics and subtly subverts the existing façade of the building. Square the Block evokes a building in transition, shifting our perception of the solidity of the stone from which it is constructed. 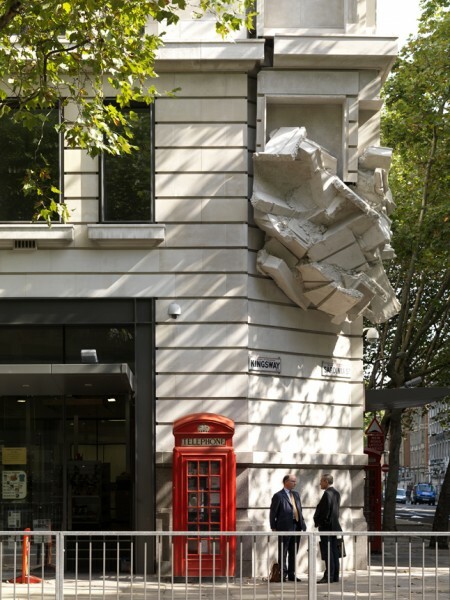 The two edges of this 5-storey sculpture are copied from separate vertical slices of the existing building that when placed together make no architectural or functional sense other than completing the corner. At its base above the pavement, the sculpture appears to have been twisted and compressed as if by a giant hand or greater tectonic forces. The work continues Richard’s singular approach to sculpture, referencing the existing architectural context and functional form in much the same way as his acclaimed piece for the Liverpool Biennale, Turning the Place Over. 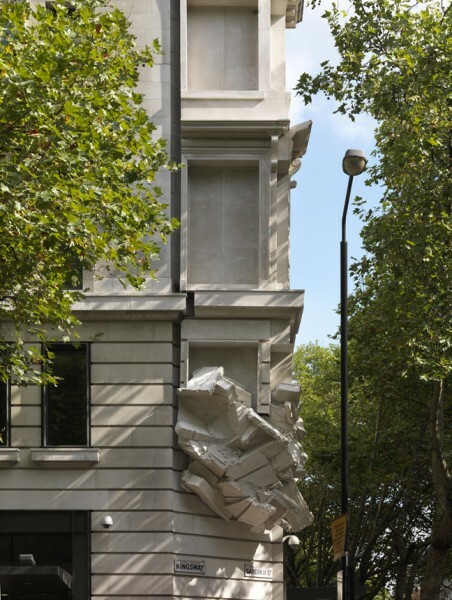 Richard Wilson has been nominated for the Turner Prize twice and was awarded the prestigious DAAD residency in Berlin 1992-03. His proposal was selected through an international competition in 2007. 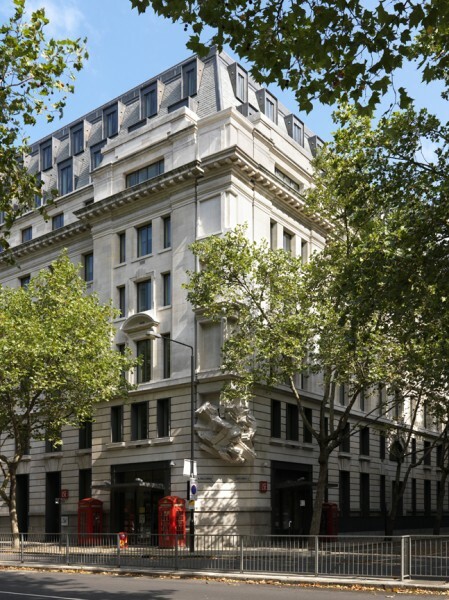 Square the Block will be officially launched on 21 September 2009 at LSE with an evening reception in the New Academic Building.